Recently I have been part of several conversations with local church leaders about the situations in their congregations. When talking with seasoned or new leaders in the church, the underlying tone is often "...we could do it, but..." That "but" is usually followed by reasons like limited finances, shortage of staff or volunteers, geographic location, etc., that prevent us from successfully being in a particular ministry. When asked by local church leaders about how to encourage their churches for their ministry, I am always confident the answers are in the strength of each individual congregation. Our mission at GCFA is to be the trusted resource for the denomination and I'm honored to be asked by church leaders throughout the connection about how we can assist with strengthening their churches. I would suggest the strength is gained when they review leadership roles and find new ways for existing leaders to serve the church. Maybe that strength comes from joining in mission with other United Methodist churches in the area -- to truly signify "United." Maybe that strength comes from stepping out on faith to embark on the ministry that has been considered for many years but hasn't taken off yet. Maybe that strength for the congregation comes from individual bible study and discernment that strengthens the group when the individual is strengthened. Regardless of the program or process, I am convinced the strength needed to move forward is found in the Word of God and in our commitment to the ministries of our connection. The people of The United Methodist Church are strong people who are grounded in the scriptures and who rely on those words for their strength. The leaders of the church find strength in passages like Deuteronomy 20:4 -- "For the Lord your God is the one who goes with you to fight for you against your enemies to give you victory." Thank you for your work in the Church. 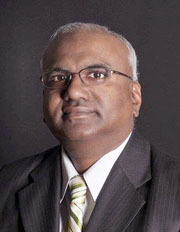 For more information about Moses Kumar, visit http://moseskumar.com/.